Don the beads and the colorful masks because it's time to celebrate Mardi Gras! Click here to play! 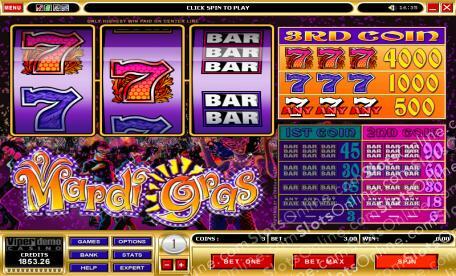 Spin these reels for a great party and a chance at plenty of big cash wins. The symbols to look out for while you're celebrating Mardi Gras are the lucky sevens. Spinning three of the pink sevens across the single pay line will get you the top prize on offer. In fact, it will bring in up to 4000 coins! Three of the blue sevens will get you 1000 coins. Three of either of these sevens across the pay line will get you 500 coins. There are also triple, double and single BARS to help you have a good time at this party! Spin three of the first to get up to 90 coins, three of the second will get up to 60 coins, and three of the last will get you up to 30 coins. Plus, a combination of any of the three will pay out. Collect your beads and get ready for a great time because it's Mardi Gras 365 days a year in this fabulous game! Spin the reels for a chance to bring in plenty of big money wins!